Be still my beating heart, our favourite shoe brand Grenson has created a stylish, brogue-y sneaker with New Balance that is the best thing I’ve seen in shoes for a long time…..(I’m not sure brogue-y is an actual word, but whatever…). HOWEVER, sadly it is for Middleagedads (or their sons) only, unless you have big feet. The sneaker, called the 576GRB, will be launched in very limited numbers from 9th January at Grenson’s Lambs Conduit Street and Soho stores and then from limited specialist stockists from 23rd January. You will have to move fast to secure your menfolk a pair. The collaboration uses the leather expertise and brogue design details from Grenson and combines it with the sneaker athletic know-how of New Balance, the 576 silhouette is one of the brand’s most successful shapes. 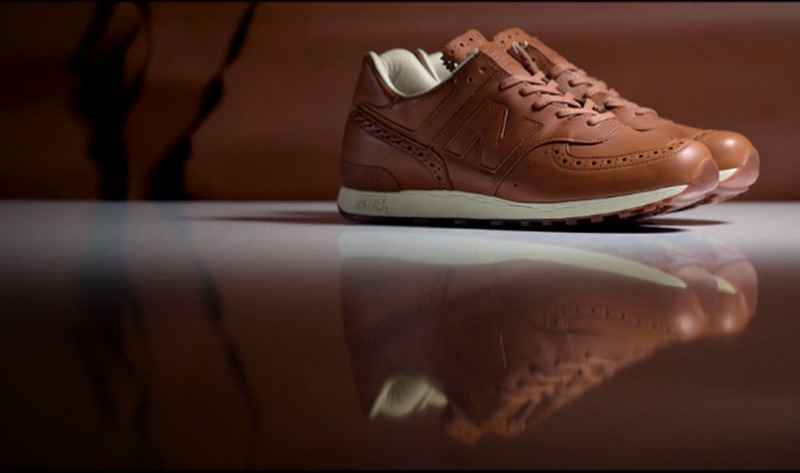 The leather used is premium Italian calfskin, shaped first in the New Balance Flimby factory in Cumbria, then sent to Grenson’s Northampton factory, where it is given its brogue detailing and the leather is burnished, then finally sent back to Flimby, where it is assembled. Aha, yes! Like Sue, I bought my first pair of Grensons (just before Christmas) *thanks* (largely) to your enthusiasm for the brand and the product. (They are rather stiff – so have been gently breaking them in around the house.) I went to the Hanbury Street shop where the (very young) assistants were extremely friendly, helpful and non-patronising to a *slightly older* customer. A good experience. Another new Grenson shoe buyer here thanks to TWR! I too found the new shoes a bit stiff but a blast with the hairdryer whilst wearing them made them mould to my feet and are now really soft despite being patent leather.